A constantly evolving mix of storytelling and narrative theatre, playwright Darren Anthony’s moving and evocative Secrets of a Black Boy brings five very different black men together for one last game of dominoes before their community centre closes. 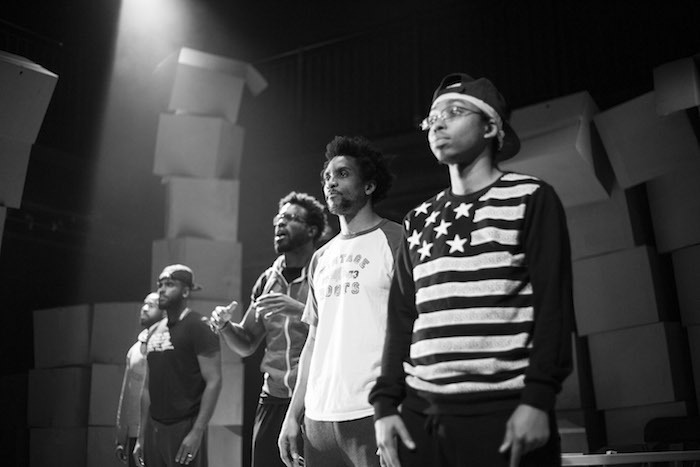 The play begins with a theatrical montage chronicling the history of black men in North America and makes its way to 2016 where the group of men take turns telling stories on an insightfully unsteady set made of moving boxes. Song, dance, and spoken word weave their way through the tale that’s been rewritten and updated over ten years as new horrors hit the black community. Eric Garner, Trayvon Martin, the Ferguson protests- all discussion points that have arisen since the script premiered in 2007 already filled with eye-opening material. A few tonal shifts are jarring (the subject changes from police brutality to “I don’t want to go to my friend’s wedding” in a matter of seconds) but the harsh juxtaposition of lighter moments (Julien Hyacinthe’s monologue about dating white women) with the darkness of the play’s most memorable scenes (Mark Sparks’ insight into domestic abuse) speaks to the complexity of a community given not nearly enough platforms like this one to tell their stories. 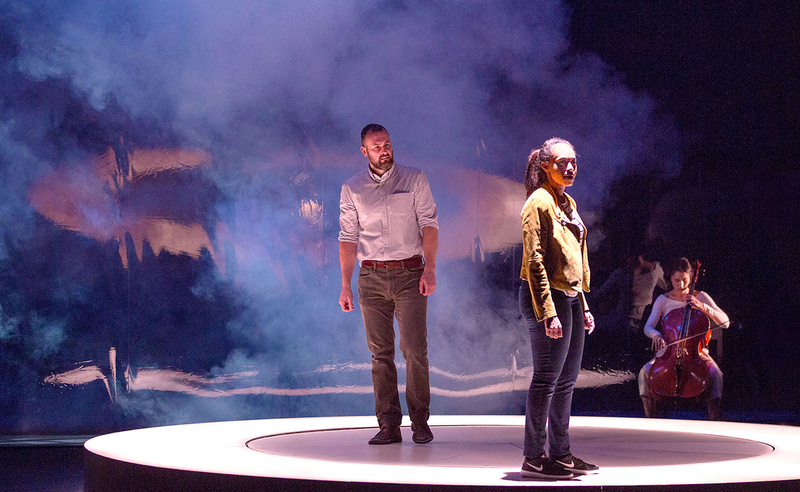 A dull story about a tragic couple told with visual flair and narrative gimmick, Constellations is as skippable a big ticket show as I’ve ever seen. It’s not bad, it’s just not much. Designer Michael Gianfrancesco’s rotating platform has given director Peter Hinton the opportunity for a few moments of moderately cool metaphor along the “how far apart are they?”/”are they moving or still?” lines and Jane Chan’s cello contributions are A+ but I simply never cared enough about Roland and Marianne to summon any real interest in how their relationship plays out differently in various universes as distinguished by individual decisions. We see Graham Cuthbertson and Cara Ricketts play the same scenes over and over again in varying order, slightly differently each time. What remains the same in every part of the multiverse is an astounding lack of chemistry between the two actors whose naturalistic (Cuthbertson) and stylized (Ricketts) choices separate them by far more than a rotating platform and the space/time continuum. 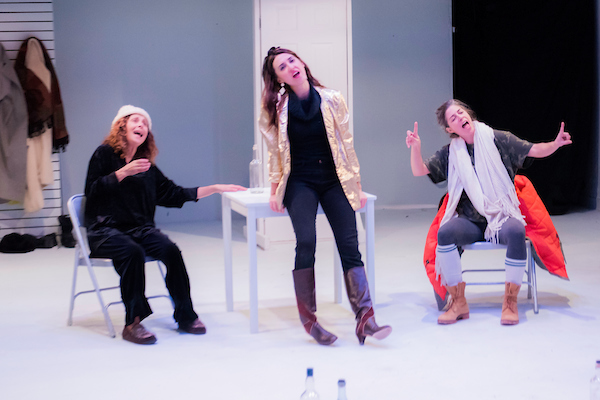 Carmen Grant‘s prudish vulnerability, PJ Prudat’s wounded unreliability, and Katie Swift’s unapologetic bizarro bravado are much-needed highlights of an otherwise uninspiring production of a confoundingly ridiculous play. Claudia Dey’s wacky, snow-covered coming-of-age tragicomedy isn’t half as empowering as it thinks it is (though I will admit that “fly your own flag” is a catchy little slogan) and the characters are so cartoonish it’s a wonder that the aforementioned three are able to make much of a mark at all. Brendan McMurtry-Howlett approaches the direction as if scared that his voice will obscure the author’s, settling for ultra-basic staging and character work with about as much nuance as the unbelievably ugly type-telegraphing costumes (designed by the playwright herself). There are moments in Beaver‘s forever-and-a-day runtime when you can look into Carmen Grant’s eyes and she’ll pull you through but those moments are too few and too often lost amidst all the nonsensical chaos.